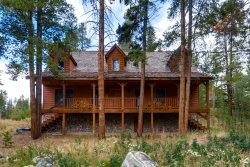 This newly remodeled vacation condo offers stunning views of Lake Dillon and the surrounding mountains. This two bedroom, two bath condo comes fully equipped with stainless steel appliances, Blu Ray Player, and a private deck with a gas grill so you can enjoy the views while cooking dinner. For those guests that would like to venture out and see more of the mountains there is an on-site free shuttle service, and you are only a short walk to downtown Dillon for all of your shopping and dining needs. Take the short walk to the Dillon Amphitheater, in the summer you will find free concerts most weekends. There is also a park with pavilion and children's playground. The Summit County Recreation Path follows along near the condo, rent a bike or take a walk. The path winds around Lake Dillon, follow it East toward Keystone Resort, or head West to Frisco. Don't miss the Tiki Bar, a local favorite for happy hour on the water. Marina Place is the perfect location to stay to enjoy all that the Summit County area has to offer. There are beautiful views with a convenient walking path to enjoy them. Close proximity to several ski resorts. Walking distance to some wonderful restaurants and a very well maintained property. Very good people, friendly and respect full to others, they lesson to you and doing a best as they can to make it write!! !